Who shall live and who shall die, the Jewish New Year approaches and we pray for a good year, for life. Each year we wonder who will pass from the world this year, we never know. On Friday September 23 I was sitting at the airport in Cleveland, passing the time while waiting for my flight. George from Canada sent me a message, "Did you hear that Gary died?" Gary who? I do not know anyone named Gary who was in critical condition, which Gary are you speaking of? No! It could not be. As always when the Angel of Death appears I have a difficult time welcoming him. I assume there was a mistake. Rewind, let's try this again. It simple can't be true. I checked the sources, I contacted a few people, it was true. Gary had written asking us to pray for his dear wife, but there was no indication that anything was wrong with him. Not until his last posting. It came as a surprise, a shock to us all. We lost a sweet kind man. We lost a humble man. We lost a real man. Dear Gary, sweet kind humble Gary, my first real friend with a Southern drawl. We go back a long time. Gary was one of our first IKI members and then instructors. He was on his ninth year with IKI. He was there at the very beginning and we grew together. He would often write how he was there at the very beginning and been part of the process and now look where we are. He reminded me where we started and how long we have come. I needed this reminder. We shared troubles and ideas. We remained close the entire time and it was always a great thrill to see him at seminars. When I heard he was coming to a seminar it just elevated my spirit. Gary with his classic thumbs up. That was his pose, his way of life, thumbs up. No matter what life dealt him - Thumps Up! Last photo we took with him we did the Thumbs Up together. He was looking forward to the future, he was eager to learn and grow in Krav Maga. He picked up all our latest DVD and was determined to master them all. He missed the next seminar. I was disappointed, Gary contacted me and said some health issues came up. Who knew that would be the beginning of the end. Gary was pure, there was no falsehood about him. He cared about people. In an era of false bravado and false machismo Gary represented a true man, and one I was proud to have as an IKI instructor, and a man I was proud to call my friend. Gary, we shall remember you, and your words appear often in my book, "Footsteps from Judea." Gary was one of the first people to buy my book, Israel: A Nation of Warriors. He was so proud of this. Be printed out the entire book when it was only an e book. He made it into a really nice project. And then when the real paperback came out he purchased that as well. He was so connected with Israel and IKI. He wanted to visit Israel but knew he did not have the means but his heart was with us. He was a loyal student and true friend. It made me feel so proud the way Gary valued that book. If I had written it only for him it would have been worthwhile. Gary understood our method of Krav Maga and was a great advocate and proponent of our approach. On at least one occasion he used a gun defense to disarm a man and save the lives of his co workers. At the point we promoted him to second dan, which he truly deserved. Although these are private correspondences I am using certain excerpts to shed light on this wonderful person. I am sure Gary will approve. I have turned away many groups over the years even in my small town and as bad as the economy was. My goal is and has always been for the greater good. Fortunately I know most of my small crew very well. A few years ago when I had no building and trained outside I was approached by a Hispanic man and he wanted me to train his CREW the way he worded that and the Tattoos on his neck with the 13 etc was unsettling. I politely told him that I worked out of town which I did and wasn't available. He was polite but said he would check back latter and see if I had a slot for them. Thankfully we haven't saw each other again- In my small gym that I mainly do personal training and fitness programs there is a 3x5 foot Israeli Flag proudly displayed-When you come through the door you cant miss it. 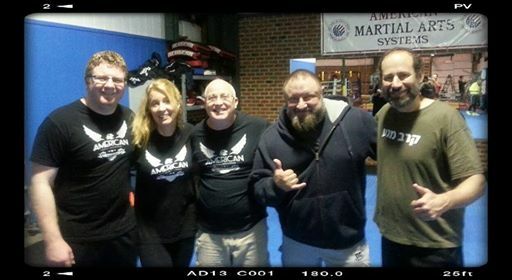 Google Christians and Krav Maga and you will see my picture with dog and some friends that I trained with. We must be careful who we empower with a skill that in the wrong hands could be dangerous for those we wish to protect. I am not politically correct,the older I get the more what I think comes t of my mouth verses what someone wants to hear. I feel that with the skill sets we have been blessed with from our lives experiences and IKI Krav Maga we are The sheep dogs who defend our sheep from the wolves .Through training and confidence our sheep become sheep dogs and the protection spreads to good people for the greater good. I agree Moshe if we film all our skills for anyone to see the wrong people may get them and it will defeat the purpose. ... I am a life long IKI Krav Maga Practitioner I love to train under pressure and in diverse conditions,I thrive in scenario training. The IKI has helped mold me into a better person,I thank you for allowing me to be a part of it-its a family. In my town I am mainly a personal trainer and run fitness programs but when we do our self defense we take it serious- Thank you for all you do- I can promise I will never ask for rank for myself when you think I am ready I will start polishing up every technique from a-z and do my best to perform. ...I thank you for the generous offer. I hope you have a great week. I just went all the way back to the very first email exchange we had when I joined IKI 7-12-08. ( That's when you had the hotmail email address) Time has flown by and hundreds emails later I am still here. Its been a great journey and much progress has been made-IKI has really grown. Every since the loss of my father in 2013 I have been in a depression and plagued with one medical set back after another. I have finally started to bounce back with a renewed fire for Krav and I want to be an asset to the IKI. At my lowest point when I felt I was nothing and my life was worthless I saw my Brown belt diploma. It brought tears to my eyes I started looking through all of my IKI material and seeing the 2nd Dan Black Belt Certificate I realize I am somebody and I am worth something. I read the letter that came with my Blackbelt certificate that you signed with a pen your dad had left. It made me feel like I was a part of something special something that can change the world a couple of people at a time. Moshe my depression was deep I was in a very dark place no one could tell I put on a happy face but as soon as I was alone the silence became unbearably loud. I have been blazing a trail to get back on track and reach my full potential where ever you think that will be. I want to thank you for the IKI it was the life jacket that got me out of troubled waters.